You can schedule your Big DoG donation any time! If you are planning on donating to Citywater for the Big Day of Giving, you don’t need to wait until May 2nd! This year you can schedule your gift ahead of time by simply visiting www.bigdayofgiving.org/citywatermusic and clicking on the Donate Now button. As Tim Stanley would say, “Easy peasy lemon squeezy.” Donations as little as $15 make a big difference! Some of your donations will be immediately supporting the costs of our May 17th performance, “Buckboard Charlie: Modern Chamber Music Exploring the Spirit of American Landscapes”, part of the Midtown Vanguard Jazz Series at CLARA. We are very excited to share a lot of brand new music with Sacramento this season. Other pieces are coming to us over the next year, so there are great short-term and long-term goals to give toward! Remember that supporting us also means supporting living composers. What a blast we all had at the fundraiser! 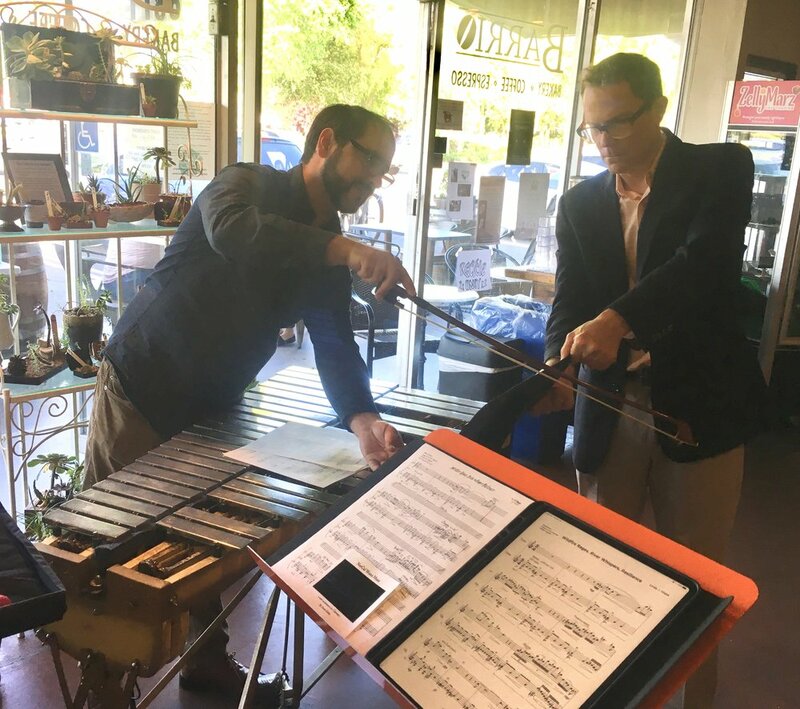 Derek Keller stopped by and gave everyone a preview of the new piece he’s working on for us (premiering this fall at FeNAM), Cathie and Ben performed and talked about Linda Chase’s piece Wildfire Rages. River Whispers. 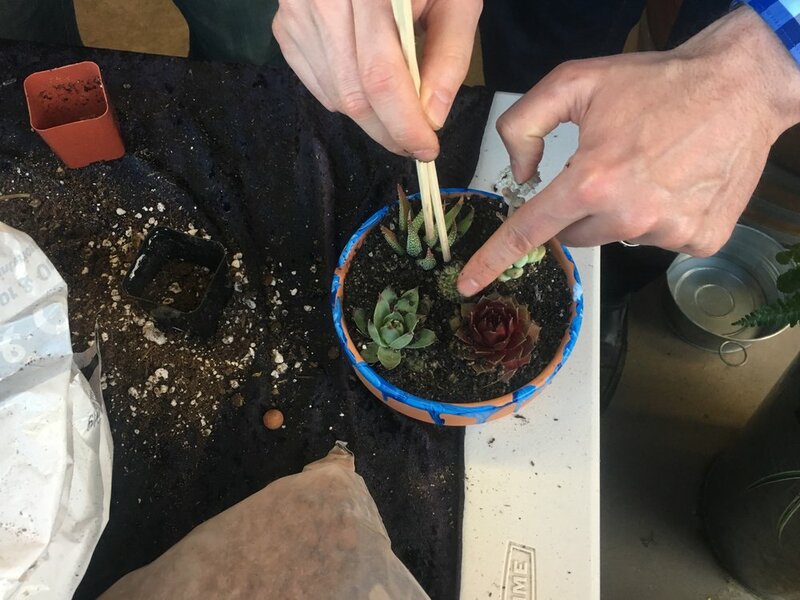 Resilience., and everyone made their very own succulent arrangement! Check out the slide show! And remember to mark your calendars for our next two big events: Big Day of Giving on May 2nd and our concert at CLARA on May 17th! This is going to be a unique and FUN event!! We are taking over the Barrio Cafe for the evening! 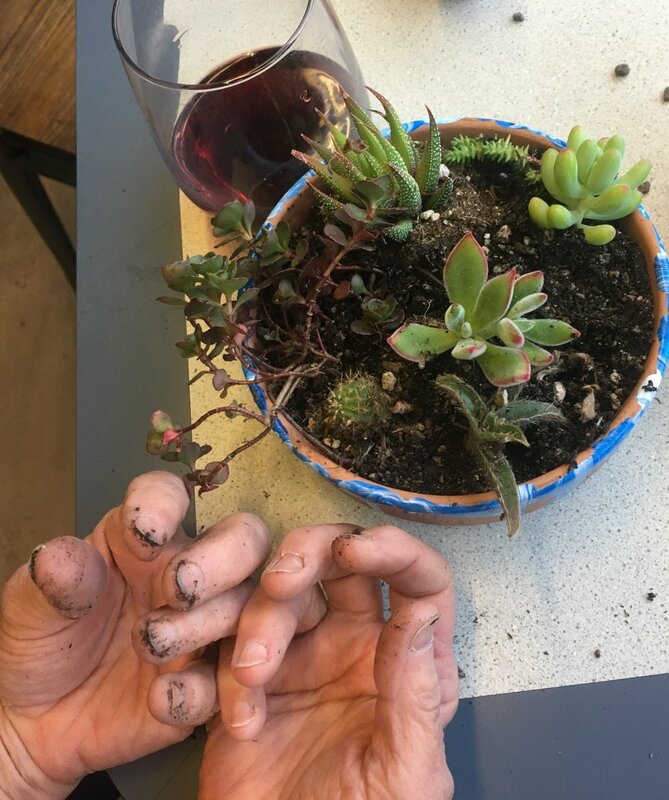 Have a glass of wine (or beer), learn how to put together a delightful arrangement of succulents, all while listening to a flute and vibraphone duet by members of Sacramento’s own new music ensemble, Citywater. The performance will include a short talk about new music and an open discussion. 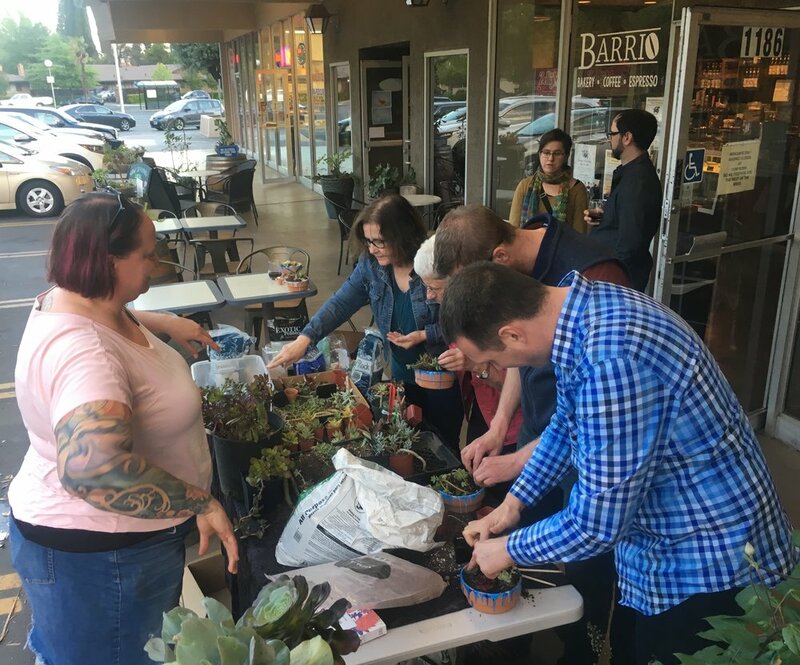 This is a fantastic opportunity for a unique and intimate Citywater experience at The Barrio, a small cafe in South Land Park. 50% of all tickets sold will go towards Citywater’s Big Day of Giving fundraising campaign. Tickets are very limited! Get your HERE to make sure you have a spot! Citywater had a fantastic time in Vallejo for the Visions of the Wild Festival! The Empress Theater is not just beautiful visually but acoustically as well…what a great place for a concert! The audience was so gracious and most people stuck around for the reception to say hi and chat with the band. A huge thank you to Nell Shaw Cohen, who was the organizing force behind the event. Another huge thank you to all the composers who wrote pieces for us; Nell, Ryan Suleiman, Christina Rusnak, Linda Chase, Ben Cosgrove, Oliver Caplan, Libby Meyer, and Rachel Panitch. Look at the navigation bar!!! Did you notice there is a new button?! DONATE! We are set up to take your donations here on this webpage! You'd really be helping us out if you checked out the page and maybe even just made a donation while you're there...you know, just to make sure it all works...and to show us how much you love us. Rivers and Trails and Visions of the Wild! We have some very exciting news for Citywater friends and fans! We have just confirmed that we will be performing a program of world premieres in the Rivers and Trails concert series, presented at the Visions of the Wild Festival in Vallejo. The concert will be September 23rd at 3pm, at the beautiful Empress Theater in downtown Vallejo. We are very excited about this cool opportunity and we want you to be there! Several members of Citywater, performers and board members, are avid backpackers, hikers, kayakers, and general outdoor adventurers, so this concert series couldn't be a better fit! This concert will kick off our season, followed by several more in and around Sacramento. We realize you haven't heard from us in a while, and want you to know that we have been far from idle...professionally and personally! Watch for updates on facebook and here on the webpage to see what exciting things we're doing in the "off season," and get to know the band and board a little better. ...and that means FeNAM is coming! For the uninitiated, that is the Festival of New American Music, an annual event that has been held at Sac State for 40 years! Well, dear fans, Citywater will be back at FeNAM again this year, with not just one, but THREE concerts! We'll be a part of the Opening Gala concert on Friday, November 3rd at 8pm. On Saturday, we'll split the noon concert with the University Symphony Orchestra, conducted by Thomas Derthick. Then, at 3, we'll play for the Student Composers Open Reading Session. In all of our performances, we'll be joined by guest artist Jennifer Ellis, a harpist who specializes in modern music. Check out her work here! We are thrilled to be collaborating with Jennifer! In the search for repertoire to play with her, much of it based on her recommendation, we've found some fantastic composers we might not have found otherwise. 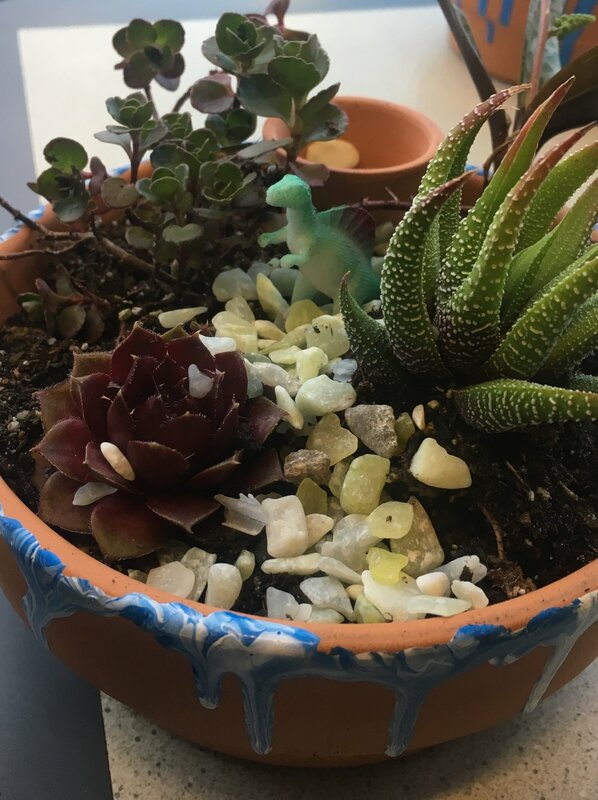 Can't wait to tell you about them! Check back soon for some previews!! For the full festival schedule, click HERE! A couple of weeks ago, Jennifer, Ben, Cathie, and Tim went to the Cap Radio studios to record some music and an interview with one of Cap Radio's classical hosts, Kevin Doherty. It was a blast! Kevin had great questions and the whole production team over there was fantastic. Well, the show aired today! If you missed it, no worries! We've got the link for you right here: CLICK ME! Enjoy! And then join us in the fall for our next season....sure to be the best yet! The Big Day of Giving is just a few short weeks away, and we are excited to have a new Director of Operations (Congrats Tim Stanley! ), a new goal, a plan for a new season, and a couple of new gifts in store for our donors. Here is the link to our profile on the Big Day of Giving website. Just click on that link on May 4th to donate to Citywater! It's that easy. If you won't be able to donate on May 4th, but you would like to donate beforehand, you can! This year you will be able to make an "offline gift" after the website is activated on April 14th. Any offline gifts made prior to May 4thwill be added to the total amount after the event closes at midnight of the 4th. Pretty great, right? Our goal for the coming 2017/2018 season is $12,000! This is our biggest goal yet. Our plan for the funds is to create a series of public concerts that will celebrate new American chamber music. We also want to commision, perform, and record pieces written specifically for Citywater by local composers. Part of the funds raised during this BigDOG will go to studio recording costs and commissioning fees. We want to get started this year on making enough recordings to have a full CD by the end of 2019. Show your Citywater pride! One of our new thank you gifts this year is a limited edition T-shirt that you can wear to all of your social engagements. Wear it to our concerts, your best friend's wedding, bar mitzvahs, Second Saturday, or even city council meetings. The T-shirts will be available to those who donate $50 and above. Below is the list of other gifts that we are offering this year. $25 - Receive a personal thank you note and photo from Citywater’s rescue dogs, Ichi and Pepper, signed by the ensemble. $50 - Limited edition black Citywater T-shirt with Citywater logo on the front and BigDOG 2017 on the back, AND get a personal thank you note and photo from Citywater’s rescue dogs, Ichi and Pepper, signed by the ensemble. $100 - Join the ensemble for beer at a local Sacramento craft brewery, receive a limited edition black Citywater T-shirt, AND get a personal thank you note and photo from Citywater’s rescue dogs, Ichi and Pepper, signed by the ensemble. $500 - Enjoy an intimate, in-depth look into Citywater's creative process at a Donor-Only open rehearsal. Beer and wine will be served, and possibly even snacks! You will also receive a limited edition black Citywater T-shirt, AND get a personal thank you note and photo from Citywater’s rescue dogs, Ichi and Pepper, signed by the ensemble. $1000 - One-of-a-Kind Citywater Art Print by local artist and board member Skye Bergen, framed and ready to hang on a wall of your choosing. You will also receive a limited edition black Citywater T-shirt, AND get a personal thank you note and photo from Citywater’s rescue dogs, Ichi and Pepper, signed by the ensemble. $2500 - Co-sponsor a Concert. Your name or business name, along with any other co-sponsors will be included in all concert advertisements and will be seen by everyone attending. You will also receive a limited edition black Citywater T-shirt, AND get a personal thank you note and photo from Citywater’s rescue dogs, Ichi and Pepper, signed by the ensemble. $5000 - Sponsor an entire concert! Your name or business name will be included in all concert advertisements and will be seen by everyone attending. You will also receive a limited edition black Citywater T-shirt, AND get a personal thank you note and photo from Citywater’s rescue dogs, Ichi and Pepper, signed by the ensemble. $12,000 - Be recognized as a Season Sponsor and receive a private concert. Your name or business name will be included in all season advertisements and will be seen by everyone attending every concert during our 2017/2018 season, and Citywater will perform a private house concert for you. You will also receive a limited edition black Citywater T-shirt, AND get a personal thank you note and photo from Citywater’s rescue dogs, Ichi and Pepper, signed by the ensemble. All first time donors will receive our first CD featuring some of our favorite live performances, and all donors get their name in every program. Mark your calendars for May the 4th (be with you) for Big Day of Giving 2017! Bookmark this page for the big day, too!